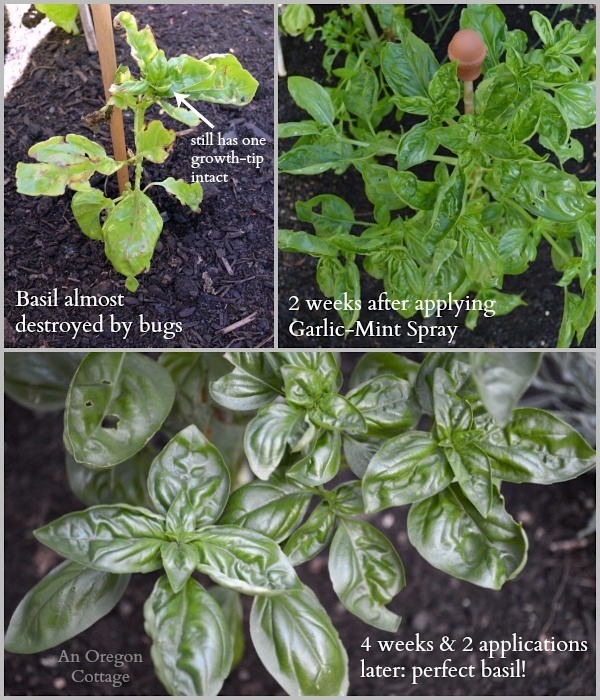 Easy to make and use, homemade garlic-mint garden insect spray was tested on badly attacked basil plants & a flowering vine and worked with only 2 applications! 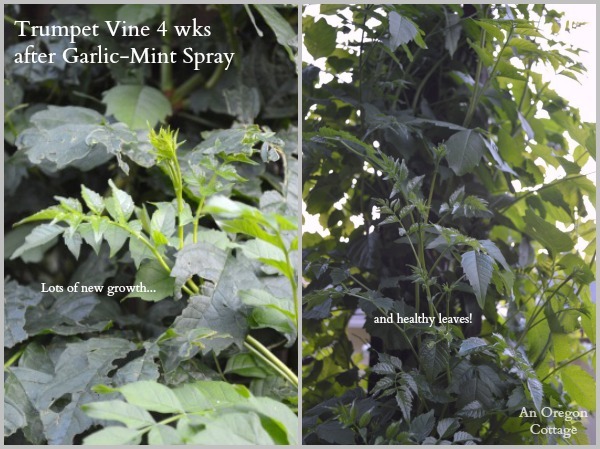 This bug spray has continued to work in my garden as well as many reader’s gardens, too. 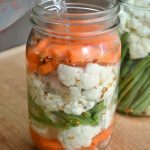 a follow-up video showing how to make it, apply it, and how it worked on green beans, too. 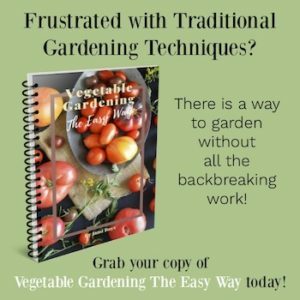 a Frequently Asked Questions page with answers to most questions I’ve gotten, plus reader testimonials about how this has worked in their gardens – both good and bad. 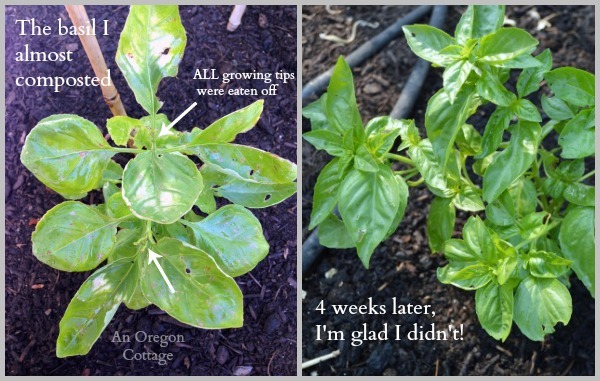 Okay guys, I’m excited to finally share with you the results of the get-rid-of-nasty-garden-bug experiment I’ve been conducting on my poor, bug-eaten basil plants and trumpet vine that I’ve shared a bit about before. I know I’ve teased you with my testing for long enough – we all deal with bugs, so I know you’ll be as happy to see the results as I was! The background to this experiment is a tale known to many organic gardeners (and maybe even would-be gardeners who gave up when faced with seemingly destroyed plants? ): years of either ignoring it (and losing plants or living with damaged plants) or trying many different remedies from diatomaceous earth (works on many things though tedious to apply, sometimes hard to find, needs a lot of reapplication, may kill good bugs) to soap and water (this never really did much in my garden). And for some reason, while I don’t have much of a problem beyond cucumber beetles in our large, main garden (and most years I don’t lose plants to them), our herb garden hosts something(s) that have eaten the basil every year since we added it to our backyard. 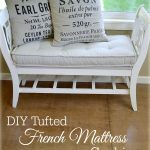 I created this spray last year (adapted from a Keeper of the Home article) to use on them, but didn’t really keep track of it, although I do remember that it worked. 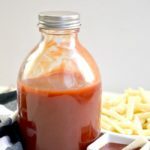 So this year when our basil was hit particularly hard as well as some marigolds I planted among the herbs and the trumpet vine growing up the gazebo across the path, I mixed up a new batch, wrote it down and documented in pictures so if it really did work, I could share it with you. And you’re not going to believe how well it worked – in fact, as I was putting this together I was thinking I was going to have to add disclaimers on the photos like “I promise these really are the same plants” or something, so you’ll believe me! So I’m pinky-swearing or whatever you need from me: the three photos in the collage above really, honestly are the same plant from beginning to four weeks later. I know, can you believe it? And also honestly: even after 20 years of growing things, seeing stunted, bug-eaten plants like my poor basil makes me want to throw in the towel sometimes. It’s just…ugh. These were three basil plants that I grew from seed, nurturing them along and to see them look like this in just a few weeks after planting out? It’s hard. And so I sprayed my homemade garlic-mint spray all over that poor plant, but I didn’t really think it was much for this world. It had only one growing tip left, but seriously, look at it (above left) – who would give that guy a chance? Well, I started seeing results within days – new growth! After a week I still was a bit skeptical – was that old bug-bitten leaves or new? But by week 2, I knew we had a winner and I snapped a picture before applying one more light spraying and then waiting another 2 weeks. 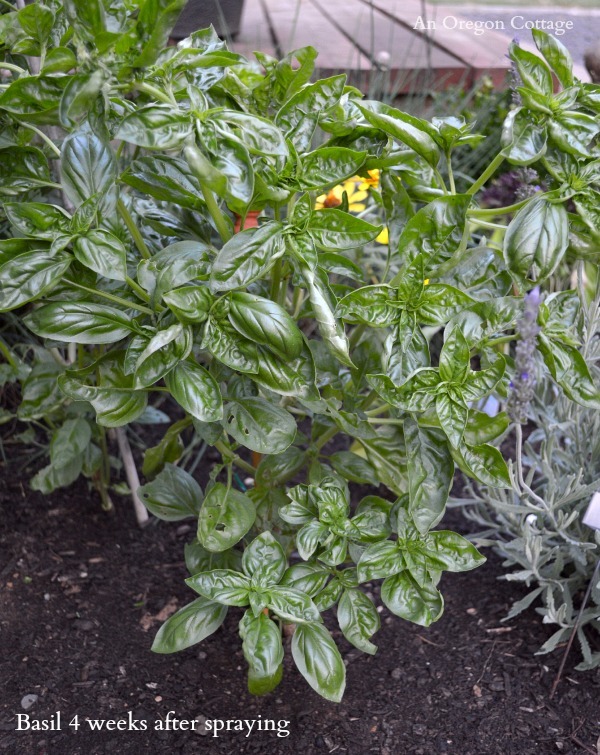 Look at this beautiful, healthy basil plant! There’s a bug-bite here and there, but I can live with that (and we organic gardeners do, often, a-hem), but most of the new growth is blemish-free and I’ve started harvesting and making our not-so-secret-ingredient frugal pesto to freeze. Now, I had to share this with you as well, even though the photos were not taken in great light. This plant on the left was the worst of the three basils – stunted beyond anything I had seen with every growing tip eaten off and the remaining leaves were hard and leathery. It was so bad I did dig it up and was just about to drop it in the compost (which I probably would’ve done if I hadn’t been planning on sharing this with you all), but at the last minute I planted it in an empty spot out in the main garden, spraying it with the garlic-mint spray. And while it took longer to rebound (duh, I would, too! ), I took the photo on the right just a few days ago, hardly believing what I was seeing. Is this stuff a miracle worker, or what? I should probably mention, too, that when I applied it the first time, we got a ton of rain the following week and I was sure it wasn’t going to work. Garden M-I-R-A-C-L-E.
And, you can probably see where this is going (should I have saved all the afters for the end? I was just too excited to share with you!) but here we have a reminder of the trumpet vine damage. This insect (I still don’t know what – I’ve never seen anything so it must be nocturnal) ate leaves like other bugs, but seemed to zero in on the new growing tips, which is a sure way to kill a plant. And now the vine is growing like trumpet vines are supposed to (that would be out-of-control, for those not familiar with trumpet vines, ha! ), full of lovely leaves and new growing tips. I think this thing has grown 3 feet in just a couple weeks, that’s how much the insects had stunted it. 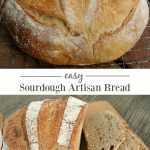 So, are you dying to know what is in the spray and how to make it? 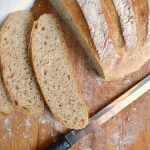 It’s super easy and uses easy-to-find (or grow) ingredients – I created it up by combining a couple of sources, none of which had a clear ‘recipe’ (I credited one source above) so I’m writing it out for you so you can make it whenever you need it. I’m so happy to gift this to your garden, because I think you’re going to love it as much as I do. Oh, and the mint? It makes this smell good – no yucky concoction here for you to suffer through. 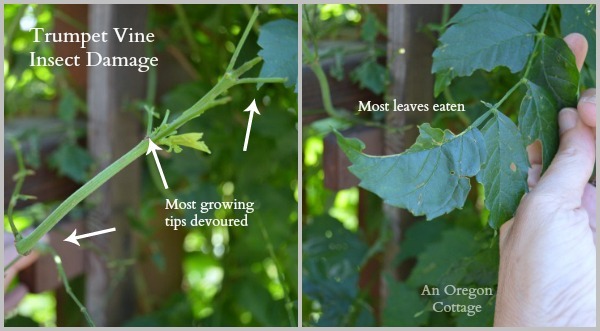 Click the green arrow for the full printable DIY Garden Insect Spray recipe! I tried your recipe for my plants outside. It worked. So, I said to myself, I wonder if this would kill bugs that coming into my apartment. It did. I used this as a natural bug repellant. I have to say it works. I wouldn’t see any type of bugs, flying or crawling in my apartment. I’m just starting to see buts that are flying around. 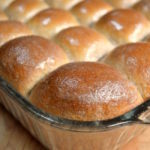 So, I had to look you up to get the recipe. This works on all kinds of bugs. I wondering does work on rodents. I’m glad to know it worked inside, too, Cheryl – I guess it’s just if you can handle the smell, lol. It repels by smell, so it would only work on rodents that don’t like the smell. Loved your video on the bug spray. Will definitely try it next season. I think you will love it, Carlie! 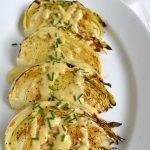 Never saw the recipe due to the annoying pop up ads. 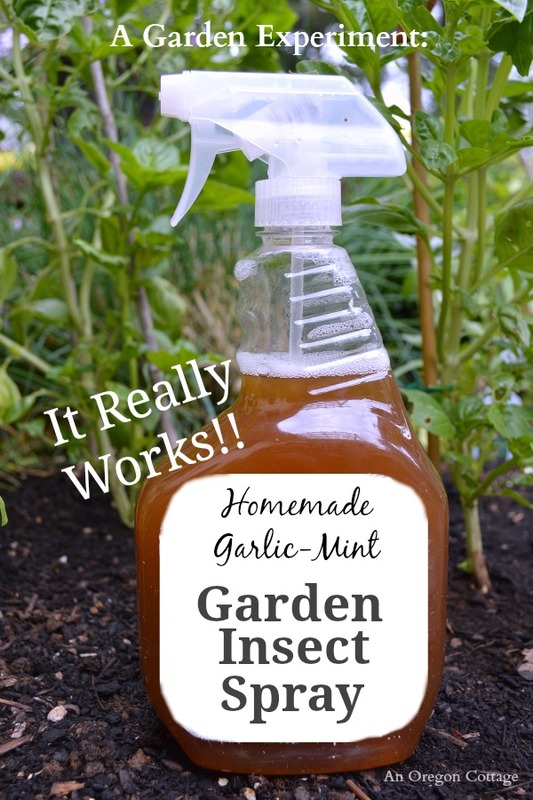 Did you kind made a alternative repellent using a garlic vine to kill a household flies? I’m not sure that would work – flies usually don’t care about scent (and this works by repelling insects). Did you use this to keep cabbage worms away. I spray at least once a week and the rabbits don’t eat my plants anymore and most of my plants are doing amazing. But I do still have trouble with cabbage worms. Glad to hear that your plants are doing better, Michelle. It works by repelling (from the smell) so that makes sense that the rabbits don’t care for it. But no it doesn’t bother the cabbage worms unfortunately. 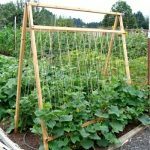 The only thing that works for them is to keep the cole crops under a row cover or to use diatomaceous earth or Bt (a more natural pesticide). Do you think this will work on ants? I haven’t tried it – I’m not sure they care about these smells (it’s a repellent). I have problems with cats with my plants. Do you know what repels cats to stay away from plants? Thanks, very helpful. I’m sorry, I don’t Edna. I bet looking it up on Google would result in some ideas! You could experiment – if you look at the FAQ page, I give ideas about how to start using oils and then seeing how they perform. Do you have to refrigerate this spray?